Children of the 1980s and 1990s might remember Swatch as a goofy but fun wristwatch brand popularized by a short-lived Fox television series. But in recent years, Swatch has modified its public persona and brought out a variety of new tools to take advantage of the growth in the wearable technology market. New reports suggest that Swatch's plans are proceeding apace and will soon result in new models of smartwatches becoming available. 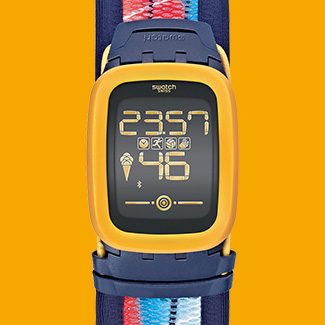 The biggest member of Swatch's smartwatch family is the Touch Zero One, and as Swatch's CEO Nick Hayek put it, “ . . . that gives enough room for Zero Five, Zero Nine.” Hayek continued in this vein, noting that the “ . . . Touch Zero One is not the end of the progression,” and revealed that the Touch Zero Two would be getting a launch at the Olympic Games in Rio de Janiero set for next year. It would be easy to think that Swatch couldn't readily compete with tools like the Apple Watch, but Swatch has a clever idea afoot. Instead of focusing on nothing in particular and trying to deliver an all-in-one experience, Swatch is reportedly focusing on making its smartwatches into specialist tools. For instance, the Touch Zero One has a focus on tracking running distances and the power of a hit in beach volleyball play. Later this year, the company is set to release models with built-in near field communications (NFC) chips, which might give the company something of an edge in the mobile payments market. This is a strategy that's daring, but as is often the case with daring strategies, it's also pretty risky. The idea that someone would want a Swatch smartwatch just to measure walking distances, the strength of a volleyball hit, or the intensity of applause—actually a feature with the Swatch Touch Zero One—is kind of a long shot at best. Given that the watch also tells time, as watches should, this could be regarded as a decently-priced watch with a few extra nifty features. But maybe there's a better plan afoot. We all remember Google Glass, and how it came under fire from many sides in personal consumer use; theaters banned such devices, as did some bars and even some local governments considered such a ticketable offense under distracted driving statutes. But Google Glass quickly found wider acceptance as a professional tool; field service reps turned to such devices as an easy way to get information about the internal workings of devices, and that was just for starters. So why couldn't Swatch come out with a Touch Zero Three that offered business functions, or a Touch Zero Two Million and Six that will accurately map constellations? Hypothetical devices all, but still quite possible. Could Swatch be on to something with its idea of a specialist tool for most any occasion? It's not a bad idea, particularly if the entry prices are low enough; some might even buy multiple watches to suit multiple needs. We'll have to watch and see what Swatch's plans ultimately look like, but the jack-of-all-trades smartwatch may be on the way out, replaced by the specialist tool with specialist looks.